Everyday Driving in Cornwall: Who Backs Up? | Notes from the U.K. Everyday Driving in Cornwall: Who Backs Up? My turn? I thought. Do we all agree about whose turn it is? In her experience, yes. In mine, not always. If you haven’t been to Cornwall, though, you need some background. The roads are narrow enough that in places cars going in opposite directions share a single lane. And it’s a narrow lane. So two drivers will sometimes end up radiator to radiator and have to wrestle with one of life’s deep philosophical questions: Who backs up? 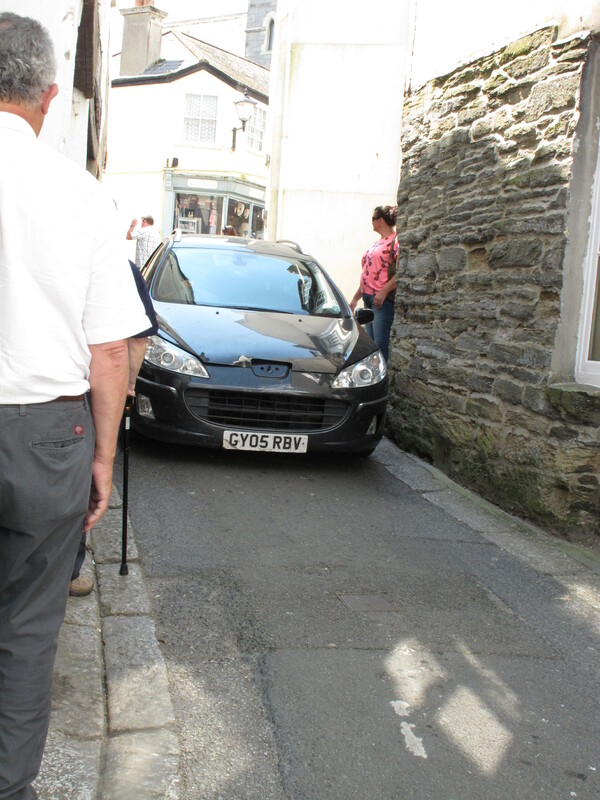 A narrow street in Fowey, Cornwall. I learned to drive in the U.S of get-out-of-my-way A., and my early experience of British driving destabilized me deeply. Forget about driving on the wrong side of the road. Forget about the steering wheel being hidden on the right-hand side of the car, where I kept forgetting to look for it. Forget the narrow roads, even. They were nothing. What threw me was the courtesy drivers showed each other. I’d see two lanes of traffic merging into one and they’d slot into each other as neatly as the sides of a zipper, with no one jockeying for position. Or I’d see some poor soul stuck in a side road, waiting to cross a lane of traffic, and someone would stop and let her or him across. Now, that is mind-scramblingly amazing. And impressive. It takes the competitive sport of driving and turns it into a cooperative enterprise. Back in Minnesota, long before I’d been destabilized by British driving, I got so pissed off at a driver who wouldn’t let me in when two lanes were merging that I allowed his car to slice open my wheel well rather than back down. I was holding out for that zipper arrangement and he was holding out for a him-first arrangement. And in case I’m in danger of sounding noble here, the one-from-each-lane arrangement favored me as surely as the him-first arrangement favored him. But he was driving what I remember as a very large a pickup and I was driving a VW beetle. If his pickup was even scratched, I couldn’t see it. Interestingly enough, neither of us stopped and neither of us reported an incident. I’m not sure what he was thinking, but I didn’t want to explain my part in it to anyone, least of all my insurance company. The papers here carry the occasional road rage story, and people are duly horrified. And people I know have met some true nutburgers on the roads (as, come to think of it, have I), but all that, I think, is outweighed by the cooperation. On the other hand, yeah, it’s still the real world, isn’t it? It’s never all sunshine and light. Mr. Slice-my-wheel-well-open has relatives on this side of the water. Where a bit of road has a sign giving priority to oncoming traffic, they ignore it. Where they’re closer to a wide spot, they still want the other driver to back up. Where an oncoming car’s already in a narrow stretch, they enter it—not because they just came around a corner and didn’t have time to react but because they own the world and the rest of us had damn well better make way. So although I’m usually happy to back up, it becomes a point of honor not to. I had a standoff here as well, but it’s a longish tale, and I’ll write about it another time. Other people I know feel the same way. H. told me a tale about doing refusing to back down in Camelford—a narrow town with serious traffic and two spots that pinch two-directional traffic to a single lane. She turned off the engine, turned up the radio, and made herself comfortable. When T. got into a standoff, he unfolded the newspaper on his steering wheel and poured a cup of tea from the thermos he’d had the foresight to bring along. Mr. Slice’s cousin must’ve been mad enough to chew his steering wheel and spit the pieces. Note: I’ve been writing madly since I started this blog, and posting twice a week. It’s been great and all that, but Wild Thing reminds me that there’s an entire world outside this house and away from the computer screen. Which is kind of funny, since I remember times when it’s taken two cats, one dog, and a small, fierce person to detach her from her own screen. But in the interest of sanity, and of seeing what’s left of the sun before winter snatches it away, I’m going to post once a week for a while. I’m not sure how long “a while” is, but least in theory I’ll post on Fridays. This entry was posted in Driving and tagged Americans in Britain, Americans in England, Britain, Cornwall, Driving in Britain, England by Ellen Hawley. Bookmark the permalink. That might just convince me to restart my car and back up. I agree with you on the difference in politeness of drivers between GB and the US. Even in my native Germany the drivers are more polite than here in the US. And then there’s the danger here that you must take into account that the other driver might very likely be packing heat. As to blogging: that can really become a time-consuming habit. Not only writing one’s own posts, but also reading and commenting on others’. And, of course, answering the comments one’s own blog. For a while [when I had 3 blogs going] I took a time-out and after that decided to have just this one [http://pitsfritztownnews.wordpress.com/]. If anyone wants to check out Pit’s blog, he’s got some very nice photos of the most recent supermoon. I believe in a “post whenever you feel like it” philosophy. Lord knows I get drowned with incoming posts at times, so it’s nice to get a break for both of us. As for crazy drivers… I think nothing beats the east coast here in the states. Small towns tend to make for far more courtesy. I’ve gone on jaunts up in the mountains where the sign says “one lane road with turnouts”. Same sort of thing, but there’s not much traffic. I just hate being the one on the outside lane with hundreds of feet of vertical dropoff. That IS where I would likely take out a book and park until the other person backed up. One lane and a vertical drop on one side? Even though I’m sitting at my computer in a relatively flat spot, that activates my fear of heights. As in ‘great sense of humour’ of course! Wow! That was an eyeopener re: the driving in Britain versus driving in the US comparison. I’m also blogging without obligation, Ellen. When it comes to enjoying summer I’m doing that from now on because it doesn’t last long and it’s my favorite season. I learned and drove here in the US, until I moved into Manhattan. Too aggressive, too nerve wracking, and despite the stories, the worst isn’t sharing the road with the cab drivers, it’s the delivery guys on bikes that make my heart stop. I grew up in New York and didn’t learn to drive until I moved to Minnesota and discovered that the subway hadn’t reached there yet. It took a while to get used to New York driving. But that’s a long story…. Brilliant! The bit about making himself a drink got me laughing out loud. Too bad I am at work, but my boss is out, so no one to watch me… Can’t help but share this, Ellen!! Pleasure! I had to close my browser down, as started laughing too wildly at the comments below the post! Will have to read them after work, not to get into trouble! Is the Wild Thing blogging too ? No, but she should be, because she’s got a lethal sense of humor. In our part of the world, we never use the reverse gear except for backing out of parking spaces- never while driving, because there is no need for that. We need to go to the next ” Exit” or roundabout and make a U-turn if we ever wanted to .And the next Exit may be many miles off. As to narrow roads, we go by another rule here- natives and non-natives or big cars and small cars- its the small cars that always give way but almost never by backing up. Does that make sense ? The small-car-backs-down system is one I never heard of. Or maybe it goes on and I’m just not aware of it, since unless I’m riled (or near a blind junction) I’m happy to back down. Makes me wonder how these things got established. Small car meaning sedans, two-seaters, hatch-backs etc..,. Right. I am (or at least my car is) firmly in that category. Big cars are cars we call Land cruisers, 4 wheel drives and cars that look more like mini-lorries than cars- large cubes or cuboids. So, big enough to run over a small car and barely feel the bump, right?